Romania's story in World War II is particularly sad. Sympathetic to the Western powers, after their defeat in 1940 she found herself surrounded by hostile nations and was forced by Germany and Russia to cede considerable territory to Hungary, Bulgaria and the Soviet Empire. Her new leadership adopted a pro-Nazi stance, and many thousands of political opponents and Jews were massacred. She provided Germany with much needed food and fuel, and when the invasion of the Soviet Union began she provided vast numbers of troops to aid the Germans. With defeat came retreat after Stalingrad, and when Soviet forces invaded in 1944 Romania found it politically expedient to change sides again and joined the Allies. With a poorly equipped army her brave soldiers suffered enormous casualties fighting on both sides. 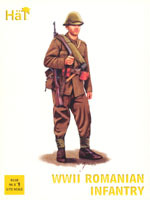 The Romanian uniform in 1940 was practical and appropriate. It consisted of a tunic with two breast pockets, and either long trousers with leather anklets or the older puttees. On the head there was a helmet of the Dutch pattern, and a side cap was also worn, newly fitted with a peak. All the men in this set are dressed accordingly, and we found no accuracy problems. A decree of April 1941 reintroduced puttees, and by the following year these were universal, so these figures are suitable for the early war, or for the final months, when supply problems saw older items reappear. Most of the men are fairly lightly kitted. They carry a rolled sheet over their right shoulder which formed part of a two-man tent and often included a blanket. On the right hip they have their bread bag, and on the left a canteen, bayonet and entrenching tool holder, although in most cases the tool itself is missing. It seems few soldiers wore a full pack regularly, and the only ones here with such a pack are the second crewman for the machine guns, which is correct. There is a good range of weaponry, all of which is typical for these troops. The last man on the second row is a 'tank killer'. Due to the scarcity of anti-tank weapons the Romanians improvised with German grenades lashed together, although this was only effective at weak points on the tank, and this man seems to be hurling it in the hope of getting lucky perhaps. He needed to be very close to the target, and therefore very agile, so he should not have all the kit he has been given, but he should have a pistol on him. The officer at the start of the third row is holding what the box calls a Beretta M34 pistol, but looks more like a German Luger (Romanians used many German weapons) or a 9mm Steyr. The NCO to his left is holding a Beretta M38 while the two-man light machine gun is a ZB30. Like all the weapons this is simplified and lacks some detail, but the ammunition clip has failed to fill the mould properly and on our example is shaped like a shark's fin, which is wrong. In the next row we find a man with a flame-thrower and wearing a gasmask, although his gasmask is of an odd design for which we could find no evidence, and beside him there is a ZB54 heavy machine gun. The final row has a 1935 60mm Brandt with its three crew, and this has a simplified support which is separate, but does not attach to the barrel in any way (due to technical problems) so needs to be glued. The poses are a reasonable selection and some effort has clearly been made to include a wide range of weapons. The sculpting is fairly basic, with some simplification such as that already mentioned and some features like short stubby bayonets on certain figures. Flash is in evidence but not too bad. Given the large part Romania played in the Second World War it is surprising that this is the first such set of soft plastic figures, but the sculpting quality is not as good as some figures being produced today, which is a pity as this is a well researched set.